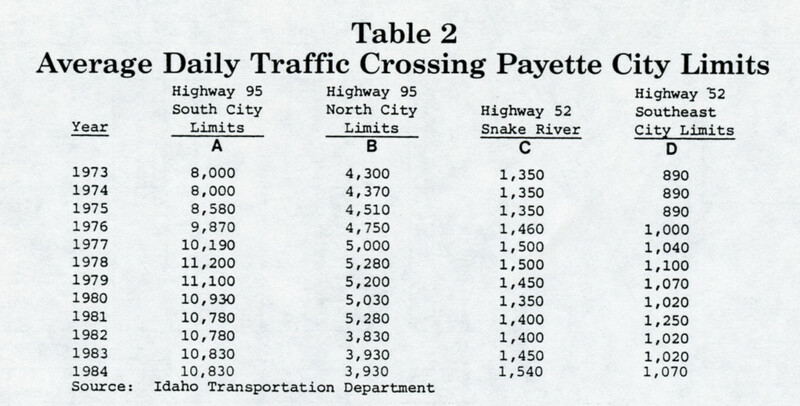 As illustrated in figure 22 Payette is served by four access points: U.S. Highway 95 on the north and south and State Highway 52 on the east and west. The downtown is connected to Highway 95 by 3rd Avenue North on the north and by a business loop on the south. In the downtown Highway 52 utilizes 2nd Avenue South to reach Emmett and 7th Street and the railroad overpass to reach Baker. The average daily traffic volumes for the last eleven years are detailed in table 2 . Transportation trends indicate that vehicle trips increased until 1979 when they declined due to higher fuel costs and energy conservation. Since that time vehicle trips have remained stable with a slight increase in recent years. The majority of the traffic use is on U.S. 95 connecting Payette to Fruitland, Ontario to 1-84 and points south and north on U.S. 95. Payette is on the Union Pacific Railroad mainline between Portland and Salt Lake City. A freight depot is located at the handsome old depot building, but Amtrak service is provided only at Ontario. Likewise, Greyhound bus service is provided in Ontario. The Payette Municipal Airport is located northwest of the city with hanger and tie down areas. No regularly scheduled airline services are available. The Boise Air Terminal provides the traveling public with a wide variety of air carriers serving the western states. Transportation access has always played a significant role in Payette’s development. Originally, it was the location of the mainline Oregon Short Line Railroad in 1884 that determined Payette’s original townsite. The building of the handsome stone and brick Union Pacific Depot and surrounding park in 1906 influenced the confidence and growth of Payette’s downtown The depot’s location at the west end of 1st Street North led to beautification along the street, including trees and a statue and fountain, as well as encouraging new commercial building in the city center. By 1920 the private automobile had become popular on Payette’s streets. U.S. Highway 30 was the main route to and through Payette, utilizing 8th Street. From the 1920’s through the 1950’s automobile traffic supported the linear business district along 8th Street. Major transportation changes occurred in 1971 when Interstate 84 was built six miles south of Payette. The interstate bypassed the downtown, which had for years supported Highway 30 users with a variety of services. Interstate 84’s location also favored, nearby Ontario, Oregon, allowing it to expand its services. 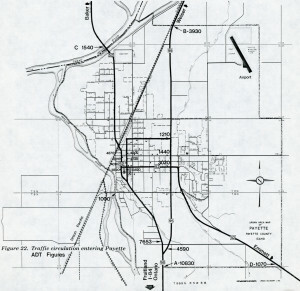 Another major change in downtown traffic patterns occurred in 1961 when the Idaho Department of Highways built the 7th Street Overpass across the Union Pacific Railroad right of way. Although the four lane overpass provided a needed grade crossing for the railroad mainline and east-west auto travel, its alignment points southward and encourages traffic activity in the southern end of the business district. Consequently, business activity in the northern end of 8th Street declined rapidly. For example, the proprietors of Maudie Owen’s Cafe reported in the 1960’s that business was cut in half since they built the overpass. The overpass location also went through the railroad station grounds taking out the small park and separating the historic depot from the downtown. Another change occurred in the mid-1960’s when the U.S. Highway 95 bypass was built on 16th Street. This removed through truck and passenger traffic from the downtown. 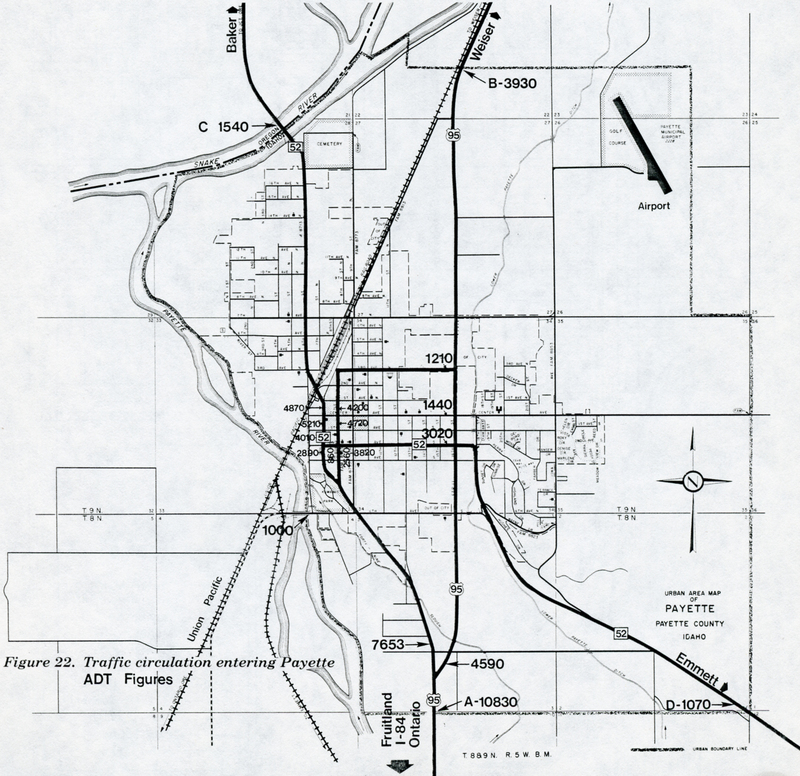 Up until 1985, Third Street and North 8th Street to the U.S. 95 junction made up the U.S. 95 Business Loop. The city now maintains this business loop. Transportation plans also proposed relocating Highway 52 one-quarter mile south of 6th Avenue South with controlled access between Highway 52 and U.S. 95. Generally, traffic flows in the downtown area work well. Very few traffic accidents have occurred over the last number of years. However, the intersection at 7th and Center does create some turning and crossing problems due to traffic on 7th and the overpass.